iOS data recovery software,recovery photos on iPhone,phone rescue. always find a safe and reliable way to retrieve the most important data and files right from your device and rescue all your lost data within 3 minutes. Have no clues to find your data? The Data Recovery for iPhone will scan your iPhone and relocate your data quickly, as well as finding a safe path to retrieve it. Lost iPhone data without any backup? Try D-Back to search and recover your lost data directly from iOS device. Super easy and no backup files needed. Quick recover when your iPhone is lost, stolen or damaged. Your precious data can be recovered from iTunes backup without connecting your device. D-Back can extract the backup data from iCloud to your computer, avoiding the situation of overwriting the current data on your iPhone. It ensures the data safety as you can download the iCloud backup to a local computer. D-Back can get various files back including popular third-party Instant Messenger Apps' history from your iPhone/iPad/iPod Touch. Your iPhone storage is undoubtedly the essence of your entertainment. So its not worth restoring anything irrelevant on your devices. You can preview your data specific contents, like time, name, call history, etc. before recovery. All scanned files will be displayed in the preview window in a category. Unexpectedly, you may also find previously lost data that you are now eager to recover. 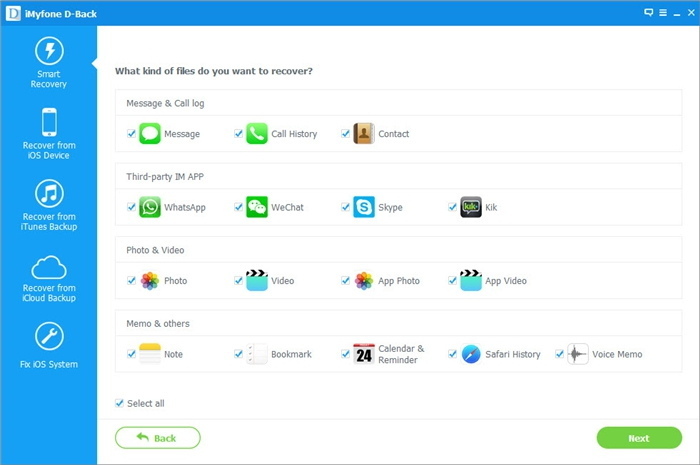 Recover all file types: messages, contacts, photos, videos, notes, App data and much more. Fast data scan & analysis to restore your lost files in 3 minutes.